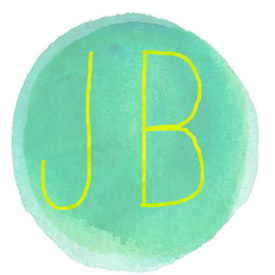 Howdy Hoo Jaderbugs! Today I felt blah so I decided to light a few candles and BAM, just like that I felt mucho-betta! But then I remembered how a while back I made these cute Duck Tape Tassel’s that I put around some candles. 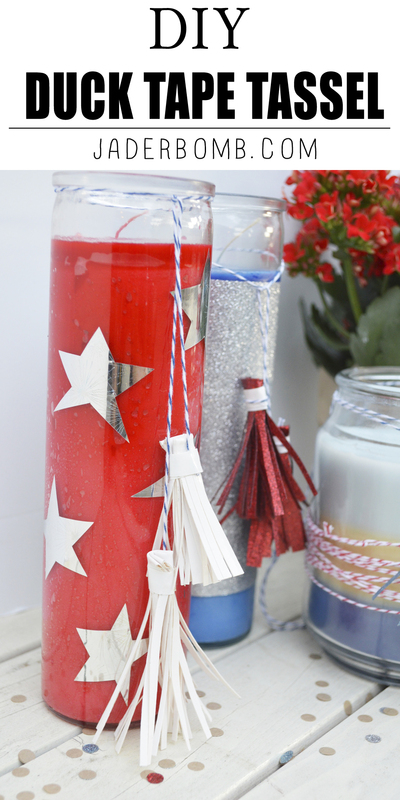 Now I am not kidding…these sticky tassel’s truly made my candles smell so much better. Ok not really but you get the point! Now let’s get STICKY! Remember when I made this Duck Tape Caddy….. the only thing it’s missing is wheels. 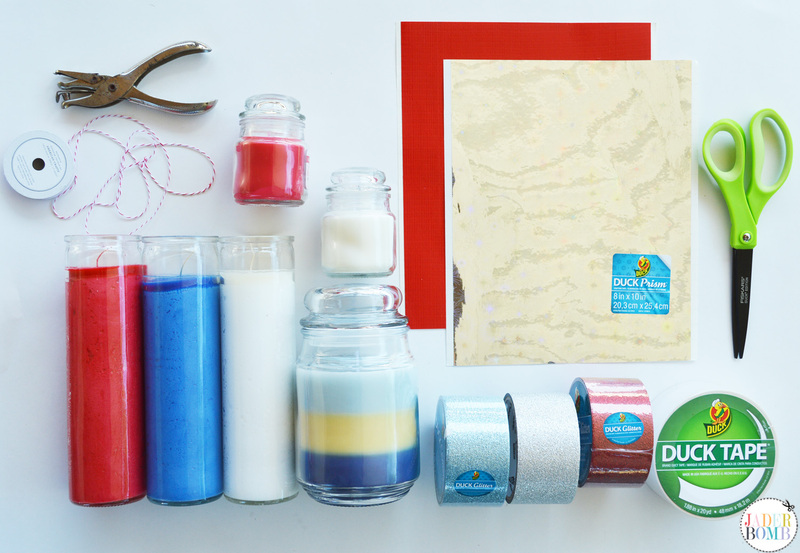 These are all the products I used to decorate the candles but you can use any color tape you want. 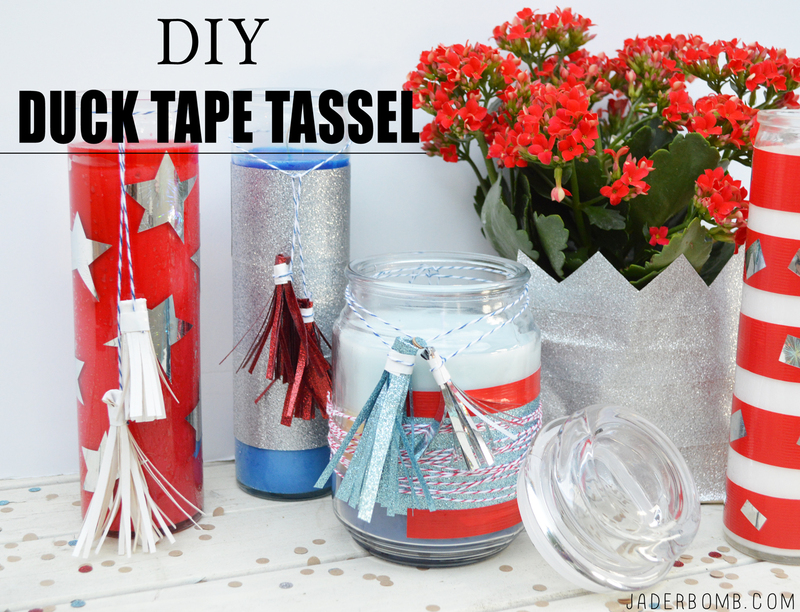 The main products you will need are DUCK TAPE (duh) and scissors. The rest are like side dishes at a fancy restaurant. I do however recommend using duck tape scissors made my Fiskars. They cut through this sticky madness like budduh. 1. To start off you will need to cut a piece of duck tape about 10 inches long. You don’t to measure to a “T” but about that length will be good. Make sure you lay this first strip sticky side up. 2. Now cut another 10 inch strip and place it directly over the first strip. Sticky on top of sticky. Once you stick these two babies together you can trim the edges. 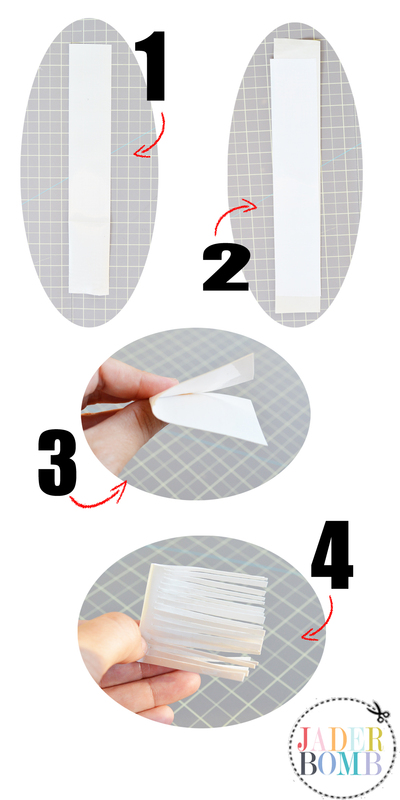 3.Fold your strip in half now. This is not the length of your tassel. If it’s too short you can make your next one longer and if it’s too long you can cut it before we move on. Boom chaka laka! 4. Kiddo’s time to get your parents involved and if you are and drunk adult do the same! 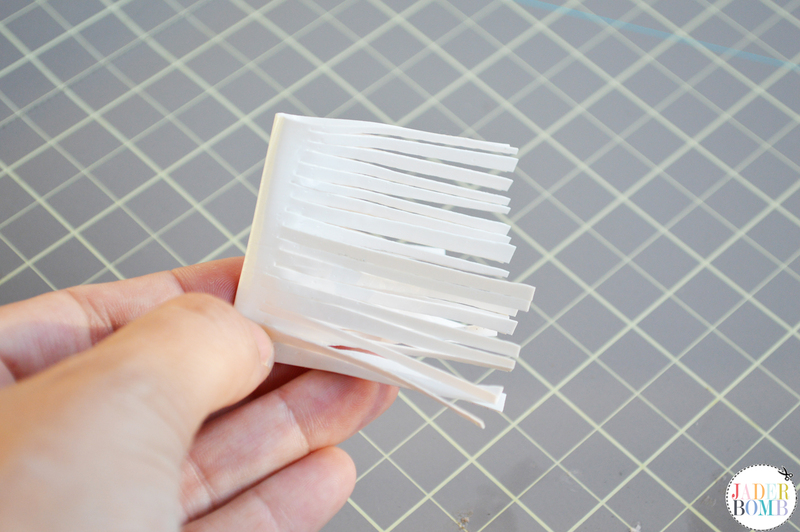 With your strip folded in half start cutting little cuts in the long side of your tape. Make sure to NOT cut all the way to the top!!! Snip away until your whole strip is fringed like it’s ready to go to a festival. If you like tag’s check out these I made with some decorative tape. How cute would it be to have an amazing duck tape fringed skirt. 5. 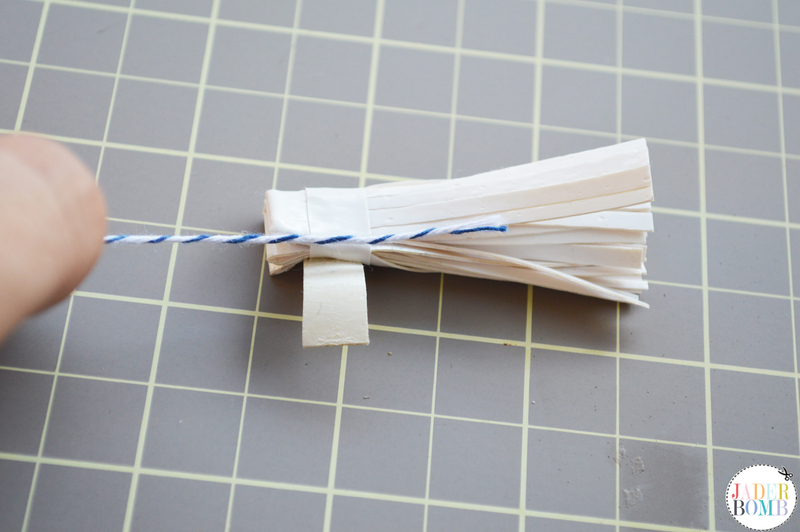 Start rolling your fringed strip from one side to the other until it’s all rolled up like the picture below. 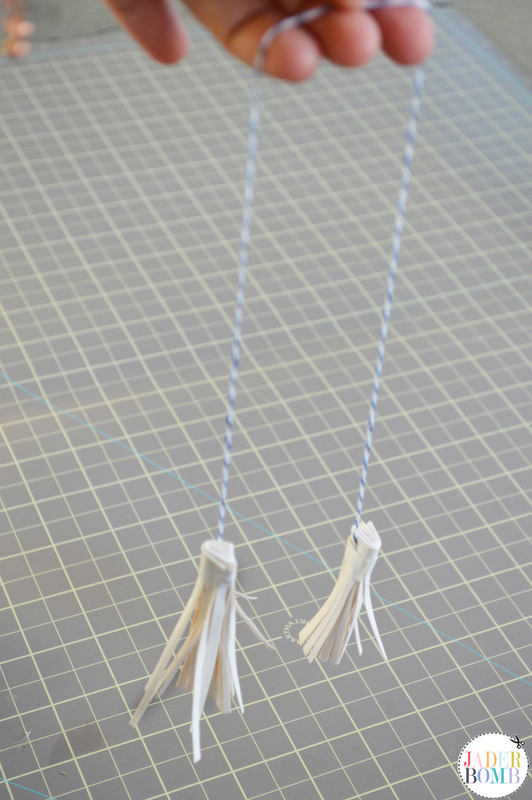 Once it’s all rolled up take a SMALL strip of duck tape and start wrapping it around the TOP of the tassel. If you notice I placed a small piece of twine at the top of my tassel right before I was done rolling it up and securing it with my small strip. This is what my tassel will hang from. 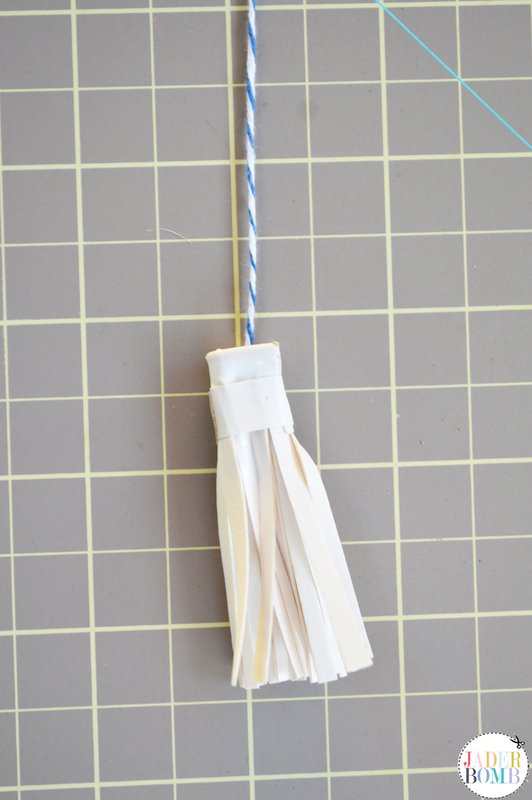 And just like that we have a hot diggity cute as can be hanging tassel. You can put this on a gift, hang from your car mirror, tie around a picture frame and so much more sha.